Warm the tortillas according to packet directions. Melt the butter in a non-stick saucepan. Pour in the eggs and chives, and cook over medium heat for 2 minutes, stirring as the egg starts to set on the bottom. Lay out the warm tortillas. 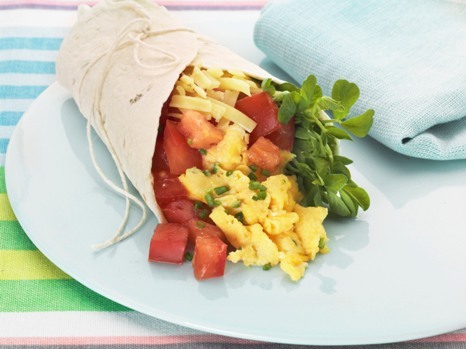 Fill with the scrambled egg, cheese, tomato and snow pea sprouts, dividing evenly down the centre of each tortilla. Fold the bottom of the tortilla up over the filling, then fold the sides over to enclose. Serve straight away.